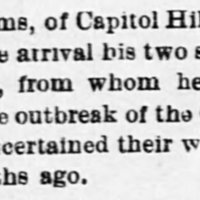 Sims, of Capitol Hill (Washington, DC), was separated from his sisters at the outbreak of the Civil War. From Mississippi. He learned of their whereabouts in 1899. “Mr. J. Sims reunited with his two sisters,” Other (Newspaper Article), Colored American (Washington, DC), November 25, 1899, Last Seen: Finding Family After Slavery, accessed April 19, 2019, http://informationwanted.org/items/show/3417.